A Fedo is a fairly small (ca. 30-50 cm long, 20-40 cm high) animal originating in underground caves on the planet Palpis. The planet was settled by the Amarrians long ago, and the Fedo has spread with Amarr vessels throughout the galaxy cluster ever since. The Fedo is an omnivorous, sponge-like creature. 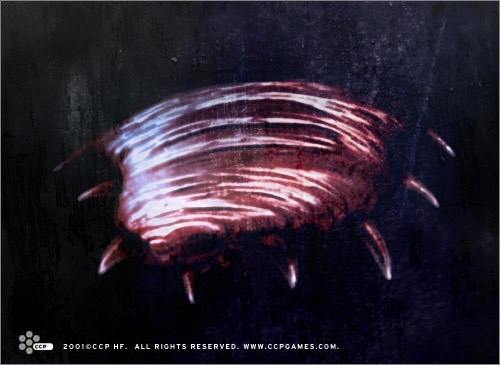 It has reddish skin and numerous small claw-like tentacles which it uses to move around and protect itself. A primitive being, the Fedo's method of eating and absorbing nutrition is slow and inefficient. This means that food stays for a long time in the Fedo’s body, and will most often have rotted or turned foul before the animal passes it out of its system. The Fedos eject fumes from their body which, for the reasons explained above, have a most horrible odor. The Fedos possess a fantastic sense of smell and so use these fumes to communicate with each other; they are however both blind and deaf, having no eyes or ears. The mouth is located on the underside of the beast, and the Fedo feeds by positioning itself over the food and lowering itself down on it. Fedos are an incredibly strong and resilient species. They can live in total vacuum for several hours before succumbing to the cold and lack of oxygen. Some Matari have used this fact to their advantage, employing Fedos on many of their ships for cleaning and garbage disposal. The Fedos are especially useful in that they can clean the ship on the outside as well as the inside; they can get to hard-to-reach areas on the ship and, most importantly, will exterminate many of the pesky bacteria commonly found on space ships. The Matari feed the Fedos with every scrap of waste produced on the ship, letting the beasts roam free around the vessel and even outside it. This saves money, but the downside is the foul stench produced by the Fedos, something which discourages most everybody from using them. There is a distinct difference between male and female Fedos. The female is slightly larger and has redder skin. It has a point-like tail or sting, approx. 10 cm long. The female Fedo can emit highly toxic fumes from a small opening at the end of the tail, which can cause intense skin irritation and discomfort for a human. For this reason, only male Fedos are used as ship cleaners. Most ships employing Fedos have a special nursery room where female Fedos are kept to replenish the on-board Fedo stock. This is necessary as the Fedo's life cycle is only a few weeks long.